That's probably going to be it, because there are now enough objects in the basic shell app that it's starting to slow down. I think Flash CS3 has a problem when you put too many things in the library, it really slows to a crawl. If I add too much more it's going to be really irritating to work on. In addition to those 32 built-in grayscale patterns, there is now a "Patterns" slot with one set of items, "Standard". The items in this set are just like any other items in that they can be colored, sized, rotated, etc. To get the effect, load up the item you want to be filled with the colorable pattern. Then load the pattern, click "Mask", and click on the target item to be filled. Just like any other masking effect. 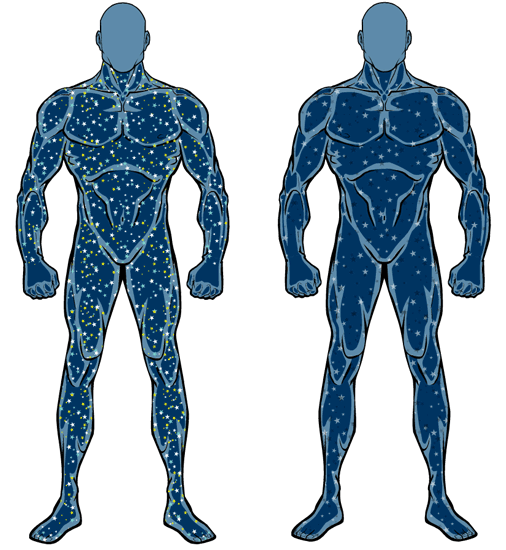 The nice thing about that is you can, for instance, have blue stars with a sprinkling of yellow ones filling a dark blue body. Or red and orange flames scaled to size to fill a deep red body, making it look like he's full of fire. With the integrated grayscale patterns you can't do that, you have to rely on the color of the original item to carry off the effect. Should I keep both the integrated patterns and the loadable, colorable set? One or the other? Neither? My opinion is that you maintain the two ways, that way anyone can use it fast or make a more detailed one if needed. As you already made with some Body items, with the sub-itens for customizing more and the full-ones that serves in the fast way. I agree with Luke. The new way is more flexible and creative. It then seems redundant to keep the integrated patterns. I definately like the idea of the pattern as a slot it works. But sometimes it’s hard to grab and move the pattern like when you have to move the character. so when you want an easy fix just go over to the patterns and click on it instead of masking it. Just wondering is there any way to move the second slot under the first one rather than having it at the side? There seems to be a little space at the bottom. Just gets kinda annyoing repeatedly going back and forth between the two slots. Then you’d also have room to possibly add a button that people can hit and it would take them to the next available slot. This would come in handy when say you’re in the right hand slot and you have to go the left hand but don’t want to go scroll and look for the hand slot in the scroll down box. And finally are the slots going to stay labeled as zombie, military etc, or is that just for the alpha? Cause Like the faces and headgear and stuff can be a little uncomfortable to navigate sometimes. I think keeping both would be the best option. Depending on the situation, either one may be beneficial. The grey-scale is a cleaner, simpler way to add textures, while the colorable one gives you more flexibility for a little more work. Good point Jester. The built-in ones seem to be a good fit for the casual user, while the loadable ones are more for an advanced user. Perhaps, to save space, you could have certain textures as grey-scales and certain ones as masked items. The masked textures would probably work better with items that would frequently be re-colored; e.g. hearts, stars, flames, checkerboard, spots, ect; patterns that would be the *design* of the material. These would just be layered over the item, making their colors be on top of the colors of the item on which they were masked. The grey-scale textures would work well with textures or items that would normally just change the shading of the item, not normally the color; e.g. leather/wrinkles, metallic sheen, cracks, shadowy/smokey, liquid, etc; basically strictly textures that would change the material or consistency of the item. These would just be darker or slightly altered colors of whatever item they were “textured” to. Another vote for both. And that starfield is awesome. I can definitely see the advantages to the seperate item slot. Also, I was a little curious, in HM3 will we have individual face parts slots for nose, eyes, mouth, etc. I kind of liked in the last game being able to trade out say a mouth to change the expression of the character. Yes, separate items for the face. I really need to get on that. Not to be a squeaky wheel again, but did you happen to see my comment about the outline effect, Jeff? Yes, I saw the comments Imp. I haven’t figured out how to do a good web pattern yet. It won’t come out looking like a Spidey costume, because that’s contoured to the limbs. Can you find a web image on the web that’ll show what you’re looking for? As for the glow effect, yes, that would be a nice feature and is certainly doable in terms of Flash’s capabilities, but I don’t know where I’d fit it into the interface. A maze pattern seems cool too. My question is would it be possible to mask 2+ items onto the body? Is that still a working progress or is that limited in Flash? I ask because I had this idea with the tribal tattoos I mentioned a few days ago, to have the tattoos on specific parts of the body. Flash only lets you an object serve as a mask for one other object at a time Tim, that’s why you can only have one texture going on an object. I would say keep both Jeff, they both do slightly different things really. I must say I am loving the mask tool, it is going to open so many more creative ideas! Looking forward to the official launch. That way you wouldn’t need to contour it. I like both of them. I have a question I don’t know if really fits here… Will we be able to have the poses from 2.5 regarding the dwarves and the females?